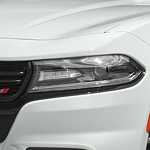 Technology in the 2019 Dodge Charger | Estevan Motors Ltd.
At Estevan Motors Ltd., we want to help you get behind the wheel of the car of your dreams. The 2019 Dodge Charger is a beautiful mid-sized sedan that is filled with advanced technological features. Regardless of your driving habits in Estevan, it will help you stay safe and connected on your journey. The 2019 Dodge Charger makes it easy to connect your smartphone. Whether you use Apple CarPlay with an iPhone or Android Auto with your Android, it'll be stress-free to connect and use. You can play music, listen to podcasts, and make phone calls without having to use your hands. The Uconnect touchscreen is intuitive to use. To make driving more fun, the Dodge Charger comes with a variety of drive modes to choose from. It will adjust the steering, engine, and transmission so that you can get the most out of your car.